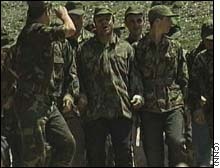 THE BALKANS (CNN) -- Thousands of new recruits are signing up to join the Kosovo Liberation Army as it battles Serb forces in Kosovo. At one hidden camp alone, the KLA claims 1,000 men are getting basic training before being sent to the front. Basic training is hard -- and fast. In just a month they must be ready for real combat. "We have very good training," said Victor, who came to the camp from New York. "We do things in a month that others perhaps do in several years." Young and old, the recruits left homes and jobs all across Europe and the United States. All of them say they are ready to fight Serb forces, who they believe are killing their relatives in Kosovo. But time is not on their side. 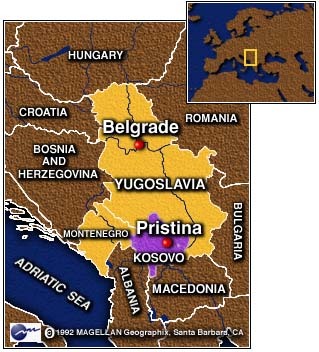 Despite 50 days of NATO bombing, Serb forces reportedly continue to ethnically cleanse Kosovo. 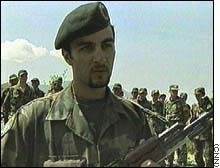 NATO has all but ruled out a ground force to fight Yugoslav forces in Kosovo, but the KLA says it should be properly armed so that NATO can use the group as their proxy on the ground. The KLA knows the terrain in Kosovo, where they have been fighting Serb forces for more than a year. Many are veterans of the Bosnian and Croat wars. But right now they are mostly on the defensive in Kosovo. They say they could increase their offensive operations. "The Serbs are technically superior, but their morale is low," said one KLA soldier. "When we directly engage them, they run or desert. They mostly fight us from a distance. What they do is assault villages that are completely defenseless." 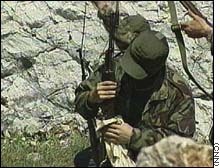 The KLA says it captures or buys most of their guns and mortars from deserting Serb soldiers. But with too little hardware, their best assets right now are their increasing numbers and fighting spirit.